Bittrex Review & Guide - Is it a Legit Exchange in 2019? Bittrex Review & Guide – Is it a Legit Exchange in 2019? The various cryptocurrency exchanges present in the current market ecosystem all offer different strengths and weaknesses, but when it comes to altcoins, Bittrex is king. With a strong reputation for reliability, security, and extensive altcoin support, Bittrex has established itself as a major hub of cryptocurrency trade. In this review, we’ll examine the features, fees, deposit and withdrawal methods, and supported currencies the platform offers. We’ll also provide a short guide on how to setup and verify an account on Bittrex, as well as deliver a short introduction to trading on the platform. It stands out from the cryptocurrency exchange crowd by delivering a range of altcoins. New coins on it are subjected to an intensive assessment process that places a strong emphasis on the security of users, making it the go-to platform for traders interested in promising new altcoins. The platform offers cryptocurrency funding options and is relatively easy to use— the broad spectrum of supported altcoins it offers can be somewhat intimidating to newer investors, however. It is available in many countries, making it a popular international trading option. Bittrex was founded by Richie Lai and Bill Shahara, both of whom have been active investors and entrepreneurs in the cryptocurrency market since inception. Notably, the partners are the minds behind GiftCardBTC, a platform that allowed users to purchase gift cards with cryptocurrency. Following the success of GiftCardBTC, the duo launched this platform in 2014. Bittrex boasts extremely high 24-hour trading volumes that frequently push the $300 million level, and to date has not experienced any security breaches or hacks. The high level of security offered by the platform is partly due to the extensive experience of the development team, who leverage experience with companies such as Amazon, Microsoft, and BlackBerry. Interestingly, the platform was designed from the ground up to deliver massive scalability by incorporating elastic computing methodologies. As a result, the Bittrex order matching algorithm is extremely agile, matching orders almost as soon as they are placed. It also offers extremely fast withdrawals and deposits and highly transparent fees. While the fees are a little higher than other platforms, they are far simpler and operate at a standard flat rate, which is more accessible to new cryptocurrency traders. Is it legit? Importantly, this exchange places a strong emphasis on regulatory compliance, and works hard to ensure Know Your Customer and Anti-Money Laundering standards are adhered to. The only drawback to this feature is that low-level verification accounts are only able to access low withdrawal and deposit limits— in order to access higher withdrawal limits it’s necessary to submit a significant amount of verification information. 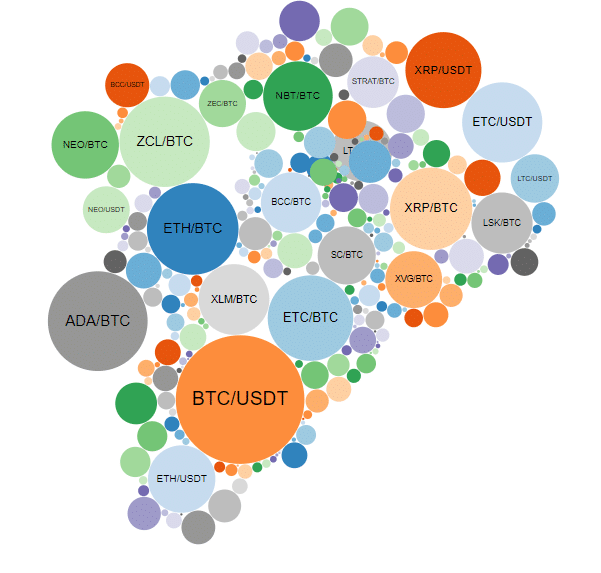 Listing a massive number of altcoins, however, is what makes it one of the most popular exchanges online. If you’re looking for the number one altcoin trading platform, it is the best choice possible at this point in time. Bittrex has recently overhauled its identity verification requirements and limits in order to adjust to the rapidly evolving cryptocurrency regulatory ecosystem and keep up with AML and KYC requirements. The sign-up process is relatively simple, involving basic email verification, but identity verification is split over two different account types— basic and enhanced. Both account types require two-factor authentication in order to withdraw capital. Its basic accounts are able to withdraw up to 0.4 BTC worth of cryptocurrency every day. 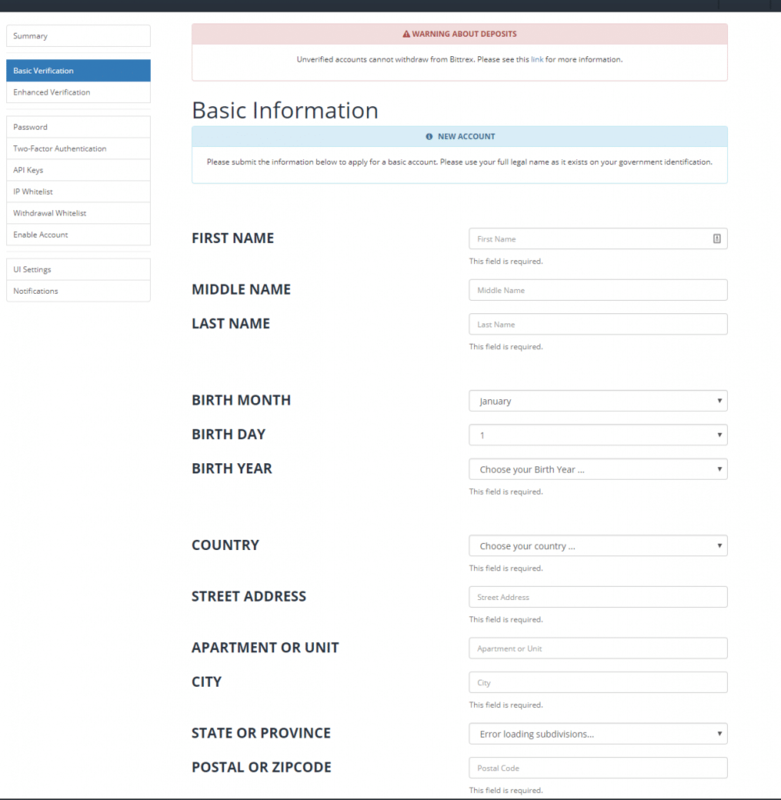 In order to achieve basic account verification users are required to submit basic identity information that includes name, address, and date of birth. It checks this information against public records and, if it matches, allows users to access basic account functionality. 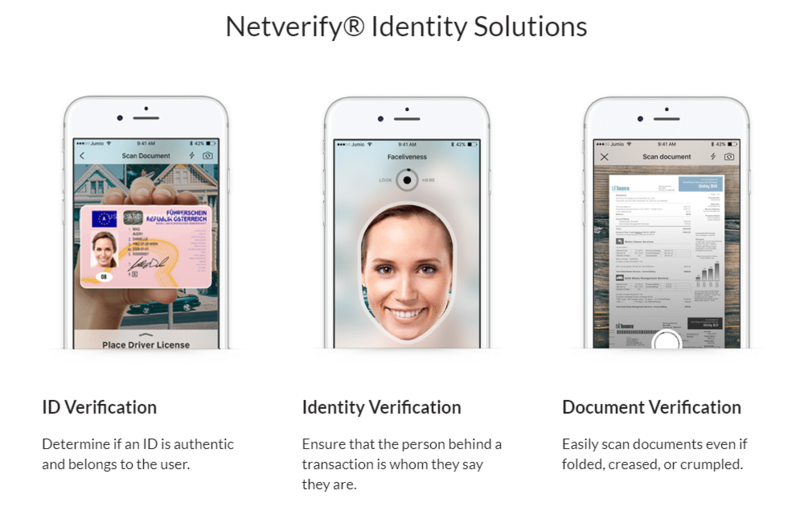 It’s important to note that this platform doesn’t perform any identity verification that requires the submission of documentation for basic accounts, making it ideal for users that value privacy. If it is unable to verify basic identity information against public records, however, users must proceed to enhanced verification. Bittrex enhanced accounts are able to withdraw up to 100 BTC in cryptocurrency daily but are subject to a more complex verification process. They have partnered with Jumio in order to facilitate automated verification. The Jumio verification method involves uploading a photo ID alongside a “selfie” image of the user, which is then analyzed with a number of heuristics to ensure a positive match. Its enhanced account verification can be performed with a range of different identity documents, which can be viewed via the Jumio site. The verification times are relatively fast for basic accounts, but can take several days for enhanced account verification. While Jumio does speed the verification process up, it’s best to ensure you’re following the Bittrex verification guidelines precisely to avoid delays. There is an extremely important difference between this and other cryptocurrency exchanges— Bittrex does not support fiat currency withdrawals or deposits. It’s not possible to fund your account with USD or any other fiat currency, nor is it possible to withdraw funds in fiat. It only supports cryptocurrencies for either deposits or withdrawals. Unfortunately, there is no option to connect to other payment gateways either— Bittrex PayPal withdrawals, for example, does not exist. They have recently made an exception to this rule— it’s possible to purchase USDT (Tether) via wire transfer. The caveat to this exception, however, is that wire transfer USDT purchases have a minimum purchase level of $100,000 USD, which is not an accessible option to casual or even intermediate investors. This option is only available to enhanced accounts. 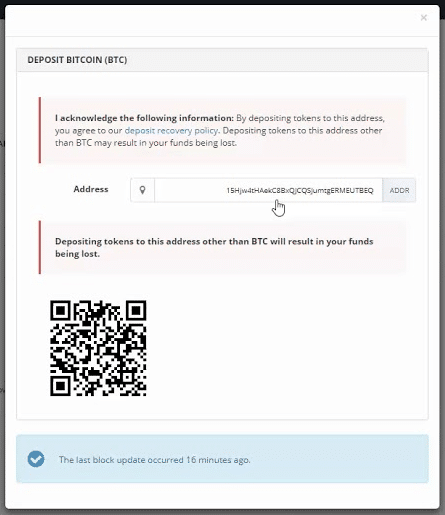 Users of Bittrex deposit USD via USDT via a specific form on the website. While the fact that this platform doesn’t offer fiat funding options does frustrate some users, it allows them to remain agile and avoids unnecessary KYC and AML complications. The pending deposit time frames are thus largely dependent on the network state of the cryptocurrencies used to fund Bittrex wallets. The currencies currently supported by Coinbase— transaction time frames are extremely short. Compared to other exchanges Bittrex fees are extremely simple and easy to understand. Most exchanges offer scaling fee structures on trading that present different rates to maker and takers in order to encourage the addition of liquidity to the order book. They keep it very simple. All Bittrex trading fees are set at a flat rate of 0.25%, with no confusing tables or scaling structures to understand. It does not charge fees on deposits or withdrawals, but it’s important to understand that some blockchain networks incur a transaction fee for sending coins— this fee is not a commission. They do charge a fee, however, to cover outgoing transactions, which can be viewed in Bittrex wallet management. As they are not responsible for the blockchain networks upon which the cryptocurrencies, it simply covers these fees as part of outgoing withdrawals. Similarly, Bittrex confirmation for deposits and withdrawals is dependent on the cryptocurrency used. The simplicity of the fee structure attracts many beginners to intermediate traders but can become expensive when placing large orders. Supporting more than 450 trading pairs and over 190 different cryptocurrencies, all of which can be viewed via Bittrex Markets view, the platform is arguably the most diverse for altcoin trading, but doesn’t offer any fiat currency support whatsoever. It does, however, support 11 different USDT, or Tether, trading pairs. Tether is a cryptocurrency that “tethers” tokens to the price of specific fiat currencies, delivering a stable token price. USDT can be redeemed directly for USD via the Tether platform, providing traders committed to USD trading with a viable workaround. Is Bittrex safe? Bittrex boasts one of the best security teams of any exchange platform online today, and as a result, the headline “Bittrex Hacked” has not appeared in the cryptocurrency news cycle once. They use an elastic multi-stage wallet strategy that ensures more than 90% of all user funds remain offline in cold-wallet storage. 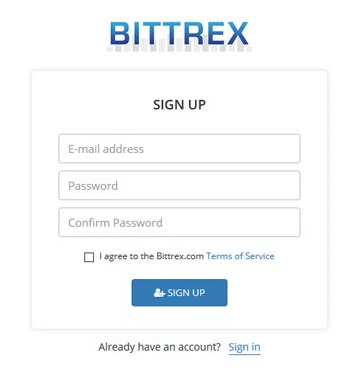 Two-factor authentication is mandatory for all Bittrex users, which ensures a high level of account security. A common question in the Bittrex community is “where is Bittrex located?”. 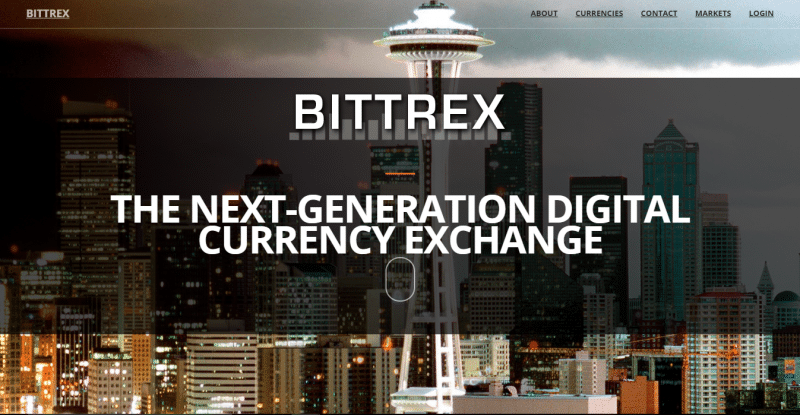 Based in the US, the Bittrex Washington State office is the organization’s headquarters. Their US base allowed it to become one of the first cryptocurrency exchanges to apply for the New York BitLicense, which means it conforms to extremely high security standards. One security feature that often causes confusion in the user community, however, is the “Bittrex automated maintenance”, or wallet maintenance feature. In the event of a possible blockchain fork, it freezes wallets until consensus on the state of the blockchain of the wallet in question can be reached. Wallet maintenance will also freeze a wallet if a developer update that affects the wallet is currently underway, or if the wallet is experiencing technical issues. The wallet status can be checked via the Bittrex status page. Any transactions sent to a wallet under maintenance will be credited when the wallet is turned back on. Offering a range of features that make altcoin trading simple and easy, such as the recent addition of websocket support, that allows for instantaneous order book updating. Users are able to browse a customizable, intuitive interface that makes locating their desired trading pair easy. Users can also benefit from notifications when orders are either partially or fully filled. Interestingly, it does allow users to open multiple accounts. 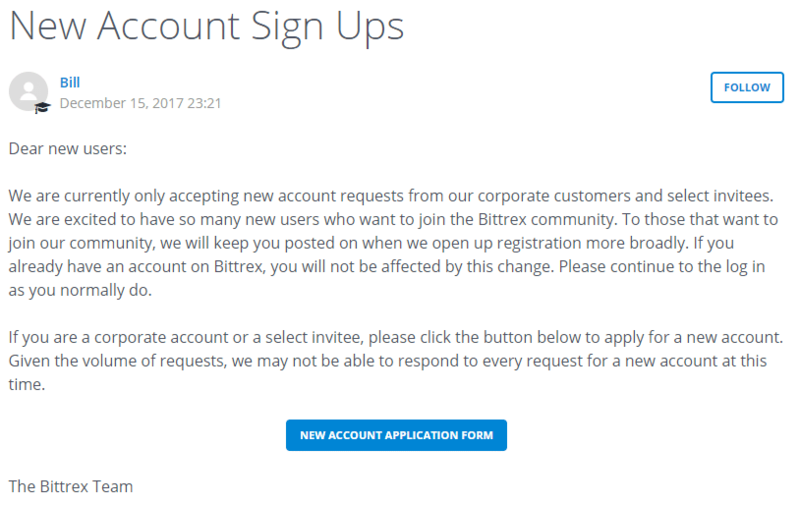 In order to prevent fraud, however, users must notify Bittrex when they intend to open another account under the same identity, and cannot trade with other owned accounts. It’s automated monitoring platform provides extremely fast transaction processing when compared to other exchanges, and provides lightning-fast order matching via a scaling algorithm. A major feature offered is the option to perform algorithmic trading via the Bittrex API, which draws automated trading professionals to the platform. It also offers complex order types suitable for advanced users. In addition to standard market or limit orders, it also offers stop loss, conditional, trailing stop loss, and more. They have also recently introduced a range of mechanisms that keep a cleaner, leaner order book, such as the pruning of orders older than 28 days and a minimum tick size of 0.1% of the current market value of any given security. The customer support is surprisingly slow to respond, and pales in comparison to the fast, snappy responses of other platforms. At this point in time Bittrex does not offer any phone support, and is currently frustrating users with long delays in resolving support tickets. Slow customer support is fairly standard in the cryptocurrency exchange ecosystem, however, Bittrex does provide a comprehensive support section that covers common questions and issues. 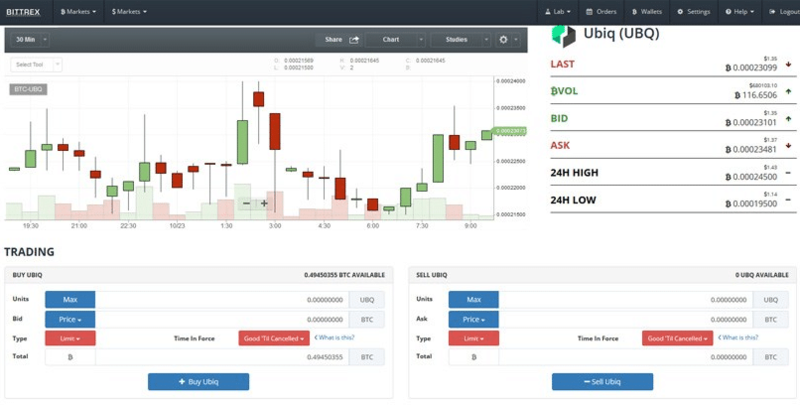 Bittrex’s market view is intuitive, allowing users to quickly select a trading pair and then rapidly switch between viewing the order book or market timeline. A variety of charting options is available as well a highly complex range of advanced studies that can be applied to market timelines. Placing and tracking orders on the Bittrex platform is similarly easy. Account management, depositing, withdrawals, and other functions are all performed via an easy-to-use interface. Wallet addresses are conveniently provided alongside QR codes for fast depositing. Once you’ve made sure you’re in the right place, you’ll need to click the “Get Started Now” link on the landing page. Once registration is open, the signup process is relatively simple. The “Get Started Now” link will present you with the following form— you’ll need to provide a valid email address and a strong password then agree to the terms of service in order to get started. It’s important to ensure that you set your account up with a strong password to minimize the risk of hacking attempts. Using a site like Strong Password Generator will create an extremely complex password that you can use to secure your account. Always use a different password for each platform or service you sign up with. After submitting your details, you’ll need to verify your email address and solve a reCAPTCHA to prove you’re not a robot. If you’re keen to get started trading immediately, basic verification is simple and easy. The verification center allows users to manage basic, enhanced, and phone verification. Navigate to the verification center under the “Settings” link of the navigation bar and fill out the Basic Verification form— you’ll need to submit your full name, date of birth, and street address. This is performed by clicking “Wallets” on the top navigation bar and selecting the type of cryptocurrency you’d like to deposit. Click the “+” button next to the wallet you’d like to fund. You’ll be presented with a popup window that provides your wallet address in both text and QR code format. Send the amount of cryptocurrency you’d like to fund your account with to this address. Depending on the network state of the cryptocurrency you’re sending, the transaction may take some time to fully process. Once your transaction has processed, you’ll see it in your wallet management panel next to the wallet it is held in. At this point, you’re ready to trade! Now that you’ve funded your account, you’ll need to learn how to place an order. In this example, we’ll take a look at the BTC/UBQ trading pair. Begin by clicking “Markets” on the navigation bar. The markets page will allow you to select your desired trading pair, or search for your pair in the top right. You’ll be presented with the order book for your selected pair. This interface allows you to view both a price timeline and an order book view and is complete with a trading interface below the main panel. Using the “Buy” panel, it’s possible to enter the number of units you’d like to purchase. If you’re happy to take the market rate, submit your order as a “market” order. To trade at a specific rate, enter the price you’d like to pay in the “Bid” field and place a “limit” order. End this step by clicking the blue “Buy” button at the bottom of the buy panel. When your order is filled you’ll receive a notification regardless of whether you’re in the market view or not. After your order is complete, the cryptocurrency that you’ve traded will be available in the relevant wallet in the wallet management view. The process for withdrawing cryptocurrency is similar to funding— instead of clicking the “+” button, however, you’ll need to click the “–” button next to the wallet your capital is stored in. It’s important to store your cryptocurrency in a secure wallet. Although Bittrex has never been compromised in a hack, all exchange wallets are defined as “hot” wallets— if the exchange itself is compromised, then it’s highly likely you’ll lose the entirety of your crypto holdings with no recourse. 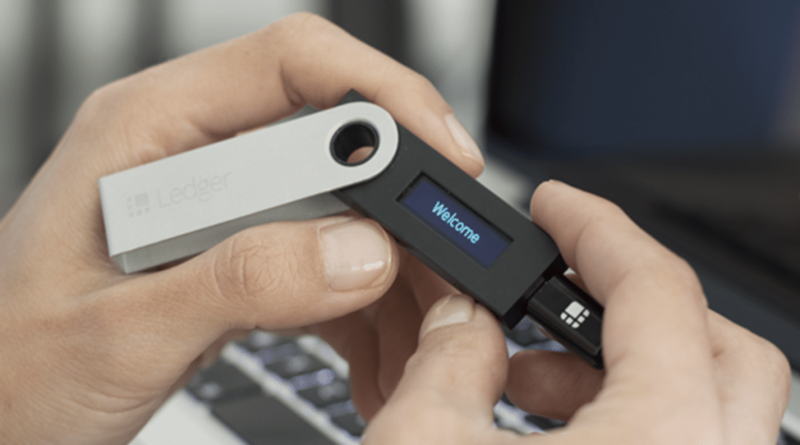 If you’re investing capital in the cryptocurrency market you may want to consider investing in a hardware wallet such as the Trezor or the Ledger Nano S. Both of these solutions are completely impervious to hacking attacks and are purpose-built cryptocurrency “safes” that allow you to store your cryptocurrency offline in a secure location when not in use. Overall, Bittrex is an exchange that offers a broad spectrum of advantages and disadvantages. While the platform lacks strong customer service and doesn’t allow users to deposit fiat currency at this point in time, CEO Bill Shihara has recently announced that USD deposits may possibly be coming to the exchange in 2018. Considering the vast range of altcoins supported, combined with the low level of verification required for basic functionality. It is ideal for traders interested in profiting from promising cryptos. Overall, Bittrex is a solid platform for both intermediate and advanced traders. Bittrex has been around for a while and in the least year really became one of the highest volume exchanges for those that want to trade altcoins, only Binance recently has overtaken it in terms of volume at least. The exchange boasts strong performance, security and is suited to both newer users and advanced ones. Previous article Kraken Review and Full Guide – Is it Safe in 2019? Coinbase Review and Full Guide – Is It Safe in 2019?